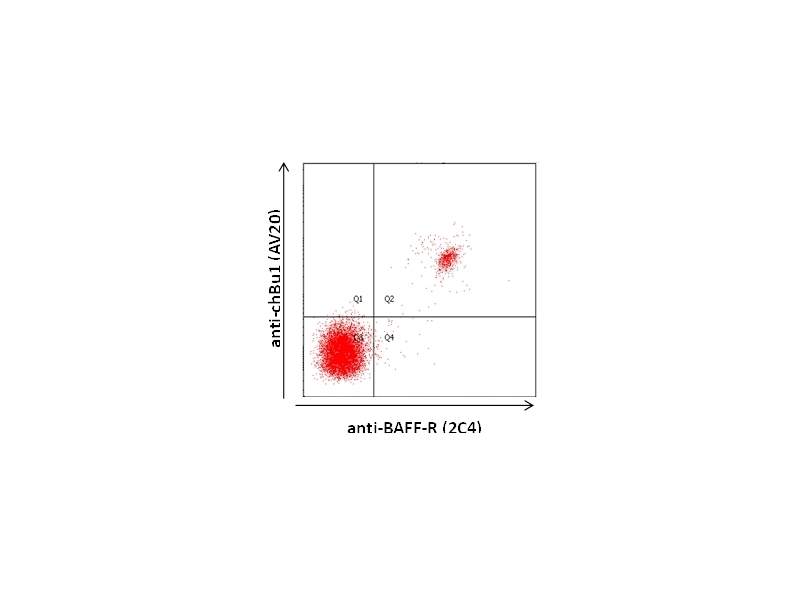 Mouse anti Chicken CD268 / BAFF-R, clone 2C4. Paraffin sections of bursal tissue were stained with the mouse anti chicken CD268 / BAFF-R antibody, clone 2C4 (2.5 μg/ml) followed by horse anti mouse Ig secondary antibody conjugated to biotin. Visualization was undertaken using a Vector ABC Kit and peroxidase activity was developed using 3.3´ diamino-benzidine-tetrahydro-chloride (DAB). Peripheral blood lymphocytes were separated by density centrifugation and first stained with the mouse anti chBAFF-R (clone 2C4) and then with goat anti mouse IgG1 secondary antibody conjugated to FITC, finally blocked with 10% normal mouse serum and followed by staining with the mouse anti chicken Bu-1a/b (clone AV20) conjugated to APC. Mouse anti Chicken CD268 / BAFF-R, clone 2C4, recognizes the chicken homologue of human BAFF-R, known also as CD268 and TNFRSF 13C, a cell surface antigen expressed by avian B-cells. Chicken BAFF-R (B cell activating factor receptor) differs from mammalian BAFF-R in that it is produced in B-cells (Reddy et al. 2008) and is not expressed by chicken T-cells. In addition to chicken, clone 2C4 has been shown to cross react with several other commercially important avian species and as such is a specific marker of B-cells for research in domestic galliforms. 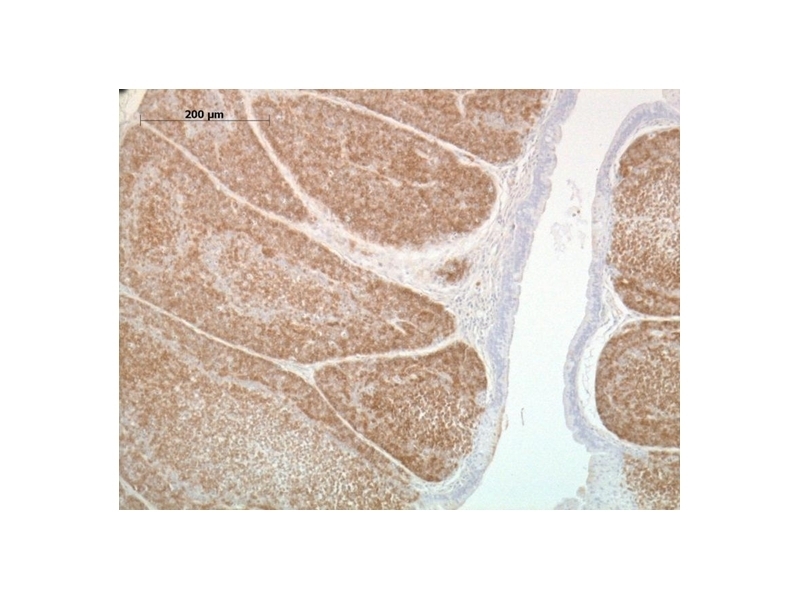 Mouse anti Chicken CD268 / BAFF-R, clone 2C4 is unique in that it can be used in formalin fixed paraffin embbeded tissues and is therefore of particular use on sections from infection studies. Reddy, S.K. et al. (2008) The BAFF-Interacting receptors of chickens. Kothlow, S. et al. (2010) Prolonged effect of BAFF on chicken B cell development revealed by RCAS retroviral gene transfer in vivo. Mol Immunol. 47 (7-8): 1619-28. Schneider, K. et al. (2004) Chicken BAFF--a highly conserved cytokine that mediates B cell survival. Int Immunol. 16 (1): 139-48. Koskela, K. et al. (2004) Chicken B-cell-activating factor: regulator of B-cell survival in the bursa of fabricius. Scand J Immunol. 59 (5): 449-57.